Last week, I posted about a book I made to commemorate a gathering of friends and where I went wrong. Here are instructions for how to make the book the right way as well as my way. The separate sets of pages make this book a great choice for group projects such as collaborations or swaps. You can also use this structure for a travel journal that you assemble after you return home. For those who missed it, when I put my book together, I realized I’d made a mistake in measuring, and I wound up with a text block that leaned to one side. I made oversized covers and added “danglies” to fill in the space along the spine. 1) Make your pages. I cut 90-lb watercolor paper into strips 4.5” x 12” to get two 4.5” x 5.5” pages with 1” left over for a glue tab. 3) Mark your tabs. With the tab to your right, use a marker or pen to draw a “this way up” arrow. Be bold; this tab will be completely covered up when the book is assembled and the arrow insures the finished book’s pages all go the right way. 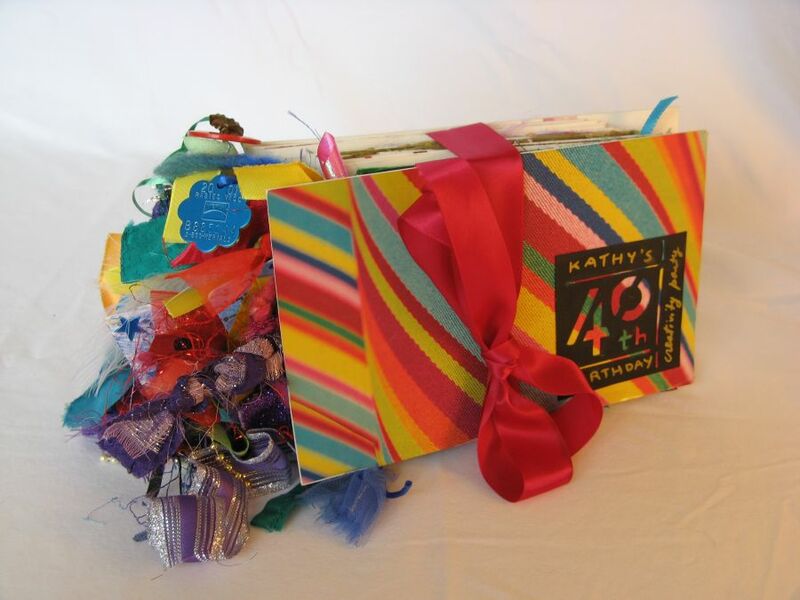 4) Pass out the pages to your friends or decorate them yourself. 5) Glue the finished pages together. 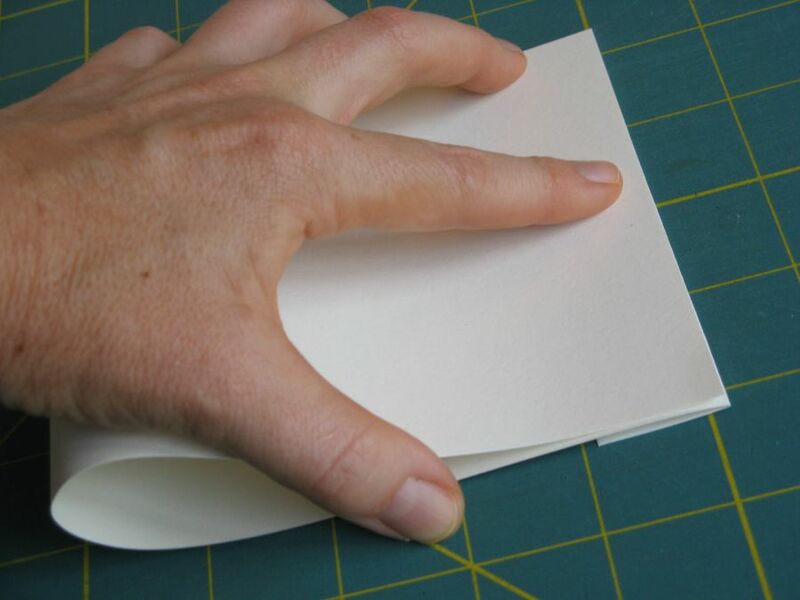 Put glue on the front of the tab and lay the next page in the book on top of it, so that the edge of the page lines up with the fold. Once all the pages are together, put the block under heavy boards or books to dry. 6) Make your book covers. Cut two pieces of mat board or heavy cardboard a little larger than your book pages. ** I like 1/8” extra along the spine, top, and bottom, and ¼” extra along the front edge. Decorate the outside of the covers. 7) Glue on covers. When the text block is dry, glue the front cover to the back of the first page. 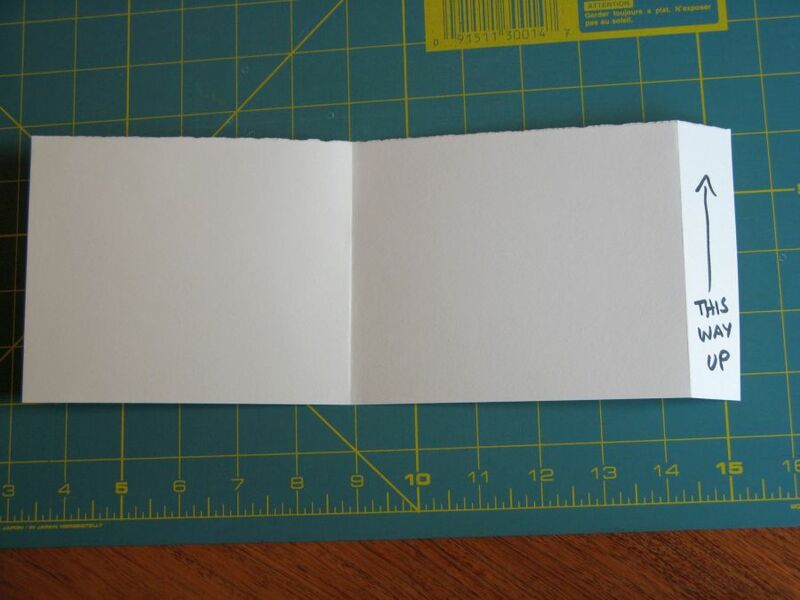 Cut the tab off the last page before gluing it to the inside of the back cover. 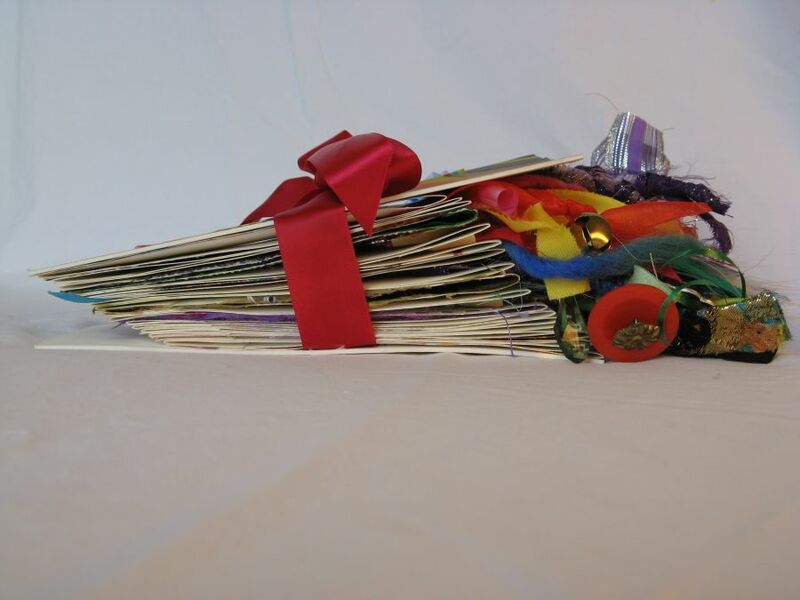 Add a ribbon tie by laying the ribbon vertically between the back cover and last page before you glue them together. 8) Dangly time! (You can add danglies to either version of this book.) 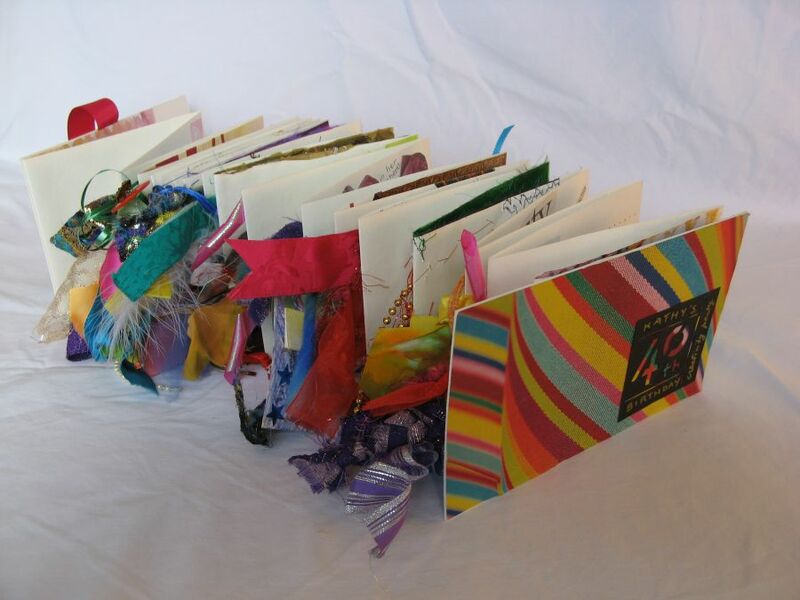 Use, ribbon, fabric, paper, buttons, beads, feathers, tags, found objects, whatever you want, and make danglies – pieces that are long enough to stick out past the edge of your book cover after you attach them behind the spine edge folds of your accordion pages. In my haste (this was so much fun, I couldn’t go fast enough), I used double-stick and masking tapes. 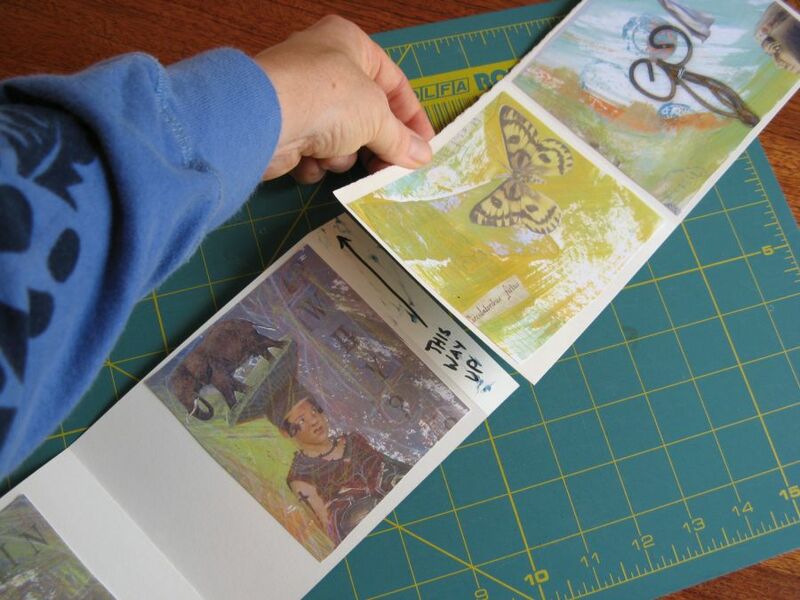 If your book will be handled much, take the time to use something more permanent, like glue. My Birthday Book, opened out, accordion-style. *To get a funky trapezoid like mine, just make the fold between the pages consistently uneven, e.g., always fold the edge to 1/8” above the tab fold. **The covers of my book cover the entire trapezoid. I just measured across the longest distance from spine edge to fore edge.